Make A Difference February Challenge! Hey, guys! I tried to do a video and it was too large to upload. I tried to do a Facebook Live video and the connection wasn’t good. I don’t think God wanted me to do a video. So I am just going to do a post. I have deemed February Make A Difference Month. I would love to see if collectively we can do 2,018 acts of kindness during the month of February. Each day I will share an idea for an act of kindness that you can do that day or save for another day or maybe it can give you an idea of some other act of kindness to do for someone. You can also get great ideas from Pinterest by just typing in “random acts of kindness” and also the Random Acts of Kindness website has great ideas. 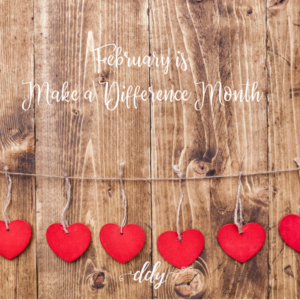 I would love for you to share this post to encourage everyone to participate in making a difference to someone every day and then together we can make February a true month of making a difference. *If you share this link through an instagram post or an email with a friend or go to my Facebook page and share it (and let me know since I don’t have a way to track shares outside of Facebook), your name will be put into a drawing for a $50 Amazon gift card to be drawn March 1st. *Each day post an act of kindness you did for someone or someone did for you by commenting on that day’s blog. For every act of kindness you post or email me at Deanna@DeannaDayYoung.com, you will be entered for another $50 Amazon gift card to be drawn on March 1st. It’s not about bragging about what you’ve done or what has been done for you but rather about sharing ideas of how we truly can make a difference to others. If you’re having a bad day, try doing something for someone else. It always makes me feel better to take the focus off of myself and help others. I will keep track and see if we can reach a goal of 2,018 acts of kindness during the month. IDEA FOR DAY TWO (February 2): Leave sticky notes in public places with positive messages on them. For example: “You look beautiful today” on the bathroom mirror at work. Or “Smile” on a vending machine at the mall. Or “Have a Great Day” on the Coke machine at McDonald’s. Let’s start today by making a difference to someone and see how we can really change the world one act of kindness at a time. *Don’t forget to share and comment! Happy February! This entry was posted on February 2, 2018 with tags: #kindnessmatters, #makeadifferencetosomeoneeveryday by Deanna Young.